Divya Joseph is helping to drive Alibaba’s international expansion. A recent MBA graduate from China Europe International Business School (CEIBS), Divya joined the Chinese e-commerce giant in October 2016. She’s now going through Alibaba’s 12-month Global Leadership Academy (AGLA) program – designed to develop the company’s future leaders – and is involved in projects driving the company’s expansion into India and across Southeast Asia. Later this year, she’ll go straight into a full-time role. Founded by inspirational entrepreneur Jack Ma, Alibaba is one of China’s hottest firms. The company has started to hire more MBAs in recent years as it expands internationally. 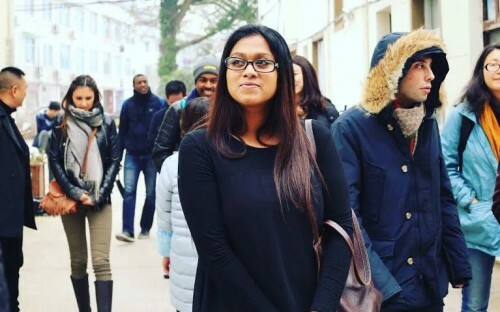 Divya applied online, made it through a rigorous screening process, and had several interviews over Skype before a three-day final round of interviews at the company’s headquarters in Hangzhou. An MBA is by no means a prerequisite for applying to Alibaba. But would Divya have landed the job without the CEIBS brand on her resume? Her answer is no. With a background in engineering, Divya trialed her own a food delivery company in her native India prior to her MBA. She started with 50 sandwiches and grew to 5,000 products in stock in a matter of months. Determined to take a career leap, she chose CEIBS over a top-ranked business school in the US. She moved from India to China with her husband and four-year-old son. What advice do you have for MBA grads applying for jobs at Alibaba? Alibaba wants people who can roll their sleeves up, get into the nitty gritty details of things, and get things done. A lot of importance is placed on emotional intelligence. There were so many smart people in the interviews, but I didn’t see that many making it to the final rounds. I came to know that it’s not about hiring the smartest people; it’s about finding the right fit. Even if you’re hard skills are really good, if you can’t demonstrate some amount of emotional intelligence you won’t be deemed a good fit. Can you tell us something about working for Alibaba that most people wouldn’t know? Even though Alibaba is a very big company, it still works as a startup. Here, employees as young as 25 can make big decisions and product changes. If you have a buy-in from people higher up, you can roll your ideas out. Innovation is at the core of the company. Things happen so fast; you have to be on your toes. Another thing here is that people don’t differentiate between work and life. Here, work is life. Alibaba is bringing small and impactful changes to people’s lives. That gives its employees even more reason to work. Every employee feels empowered and they strongly believe their work is directly impacting lives for good. Some people here stay in the office until eight or nine at night, without even feeling that they’re working. And the teams here are very close. It’s a stark difference to what you see in the West where people keep their personal and professional lives very separate. There is no line like that at Alibaba. I needed a career change. I was in touch with the admissions office at the University of Michigan’s Ross School of Business in the US. But, given how business is moving east, it was evident that I had to be in a growth economy. Looking at business schools on this side of the world, CEIBS stood out as the best option. It’s a world-renowned MBA program, and it offers a great return on investment. How have you found adapting to life in China? Everything here is different. The food was one of the biggest culture shocks – we don’t eat as much meat as they do here, in India. And, of course, in the first few months we had to concentrate on learning the language. I had a nanny I had to speak to! Overall, living in China is a beautiful experience, and the people are very welcoming and kind. If you can speak just a little Mandarin, they really embrace you. Would you be where you are today without the CEIBS MBA? Without the CEIBS MBA, I don’t think this opportunity at Alibaba would have opened up for me. When you go into an MBA program, you’re put together with a set of people who are competitive, entrepreneurial, and want to make a difference. It’s a different world! It pushes you, challenges you, and tests your limits. This experience prepared me for the job market here and helped me get a well-rounded view of world business. One course I took on platform strategy – about new disruptive business models – is directly linked to everything we do at Alibaba. I am not sure how many other school’s offer this kind of course.